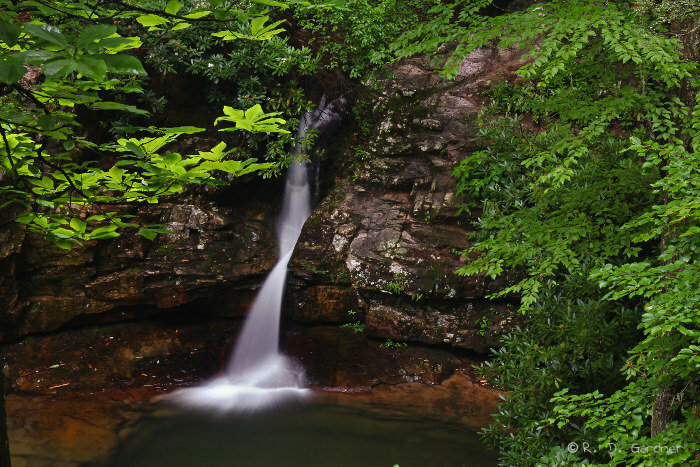 Blue Hole Falls is different. It is actually a series of four separate waterfalls all located with a few feet of each other. I have arranged the pictures on the left in order from upper to lower falls so you can see how the water flows from one to the next. While the WOW Factor is a little low, I give Blue Hole some credit for being darn neat and easy to get to - a solid 6.5. Greg Plumb, on the other hand, wasn't so impressed and only gives it a 2-star rating. My last visit was in late January and the water flow was higher than normal. To be honest, the waterfall isn't normally this photogenic. I arrived late in the day so getting long shutter speeds wasn't a problem either. This is a popular spot in the summer time and trash is a constant problem. Many people also rappel off of the nearby bluff (where I was standing to take the picture bottom left). 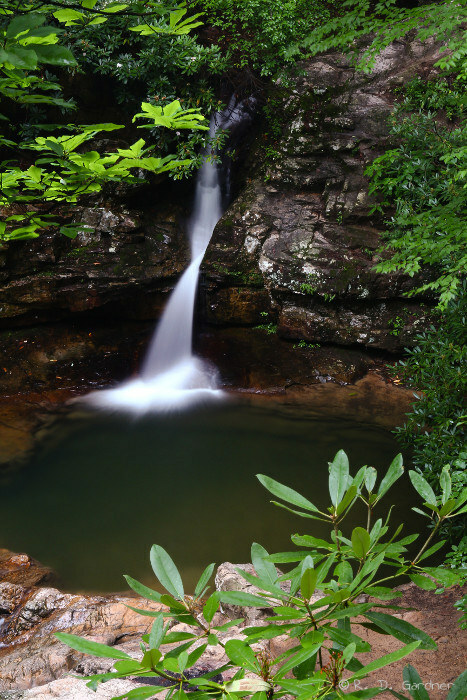 The plunge pool below waterfall #3 is most likely the namesake for the falls and is quite pretty. 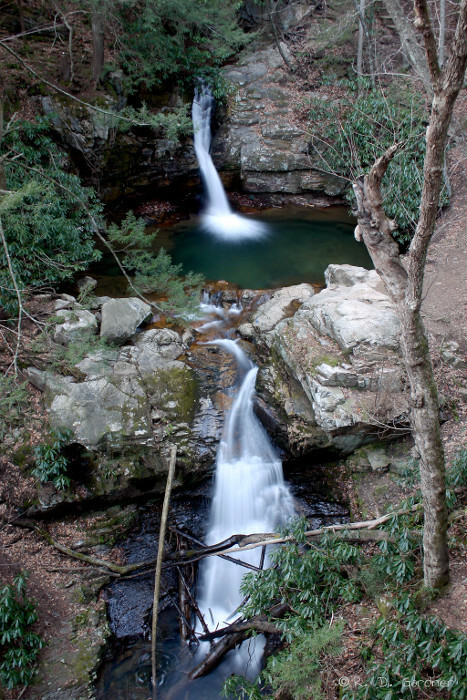 Waterfall #2 is almost hidden in a grotto above #3 and is the highlight of Blue Hole in my humble opinion - just a really neat setting. 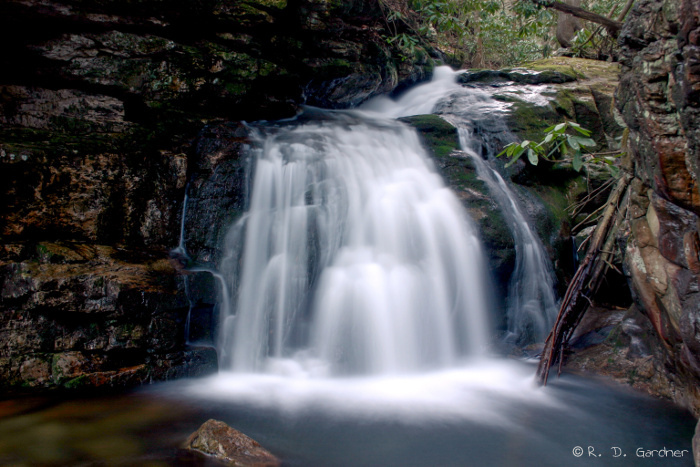 This is another waterfall that is easy to find. Take Highway 91 east (NE really) out of Elizabethton, TN for about 10 miles. Turn left onto Panhandle Rd at the big, brown national forest sign for "Blue Hole". After the road turns to gravel look for a small parking area on the left side of the road (1 mile or so, I didn't keep track, sorry). There is room for maybe 6 cars or so. To get to the overlook, take the small trail that starts just to the left of the parking area near the road. It will twist through the trees and go down about 30 feet or so to the overlook. Be very careful. To go to the plunge pool, go back to the parking area and follow the 4-wheeler trail for 20 feet or so and take the trail that goes down the hill to the left. 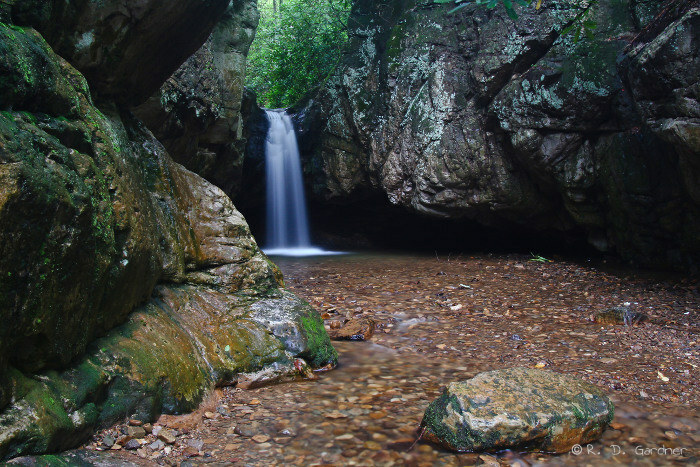 You can either follow the trail down the steps to the bottom, take the first right to the upper falls, or look for another side trail about 1/2 way down that goes to the middle grotto falls. The entire area is very compact so you aren't going to get lost. I was at Blue Hole Falls in late January. The day was overcast and I purposefully arrived later in the day, around 4:30 pm or so. I've been to the falls before and my recollection was that the lack of foliage would not be a big detriment. I was right. 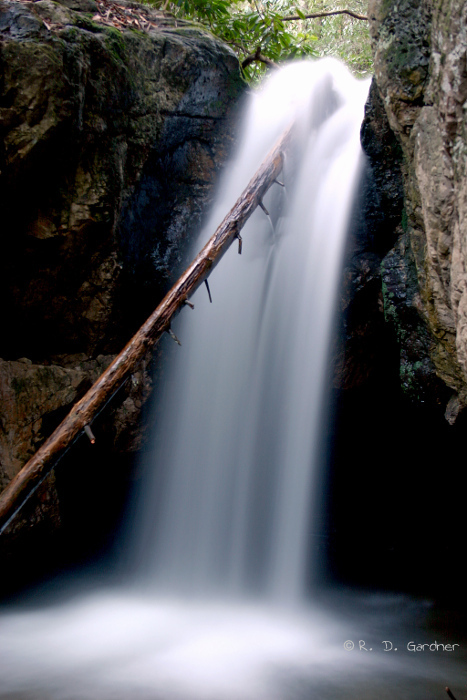 The lower falls are exposed so plan accordingly. I didn't have my GPS yet so the face direction of 150° is an estimate. Generally all four of the drops face the same direction. Either a morning or evening shoot should work here. 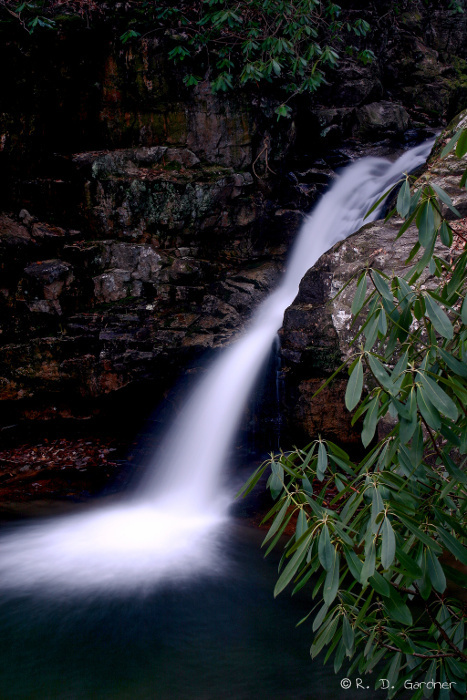 You will have glare and reflection problems on the rocks and rhododendron leaves so plan on using a polarizer. And as always, a tripod is a must. Here you go. This is an all new video of yours truly at Blue Hole Falls, shot by Ron Zucker. If the embeded video doesn't pull up try this link to Blue Hole Falls video.